The story about Abbas' Big Lie, Big Blood Libel against Jews at the European Union parliament last week is too big to let it be forgotten. Of course Abbas and other PLO/PA spokespersons --think of Sa'eb Erikat, Hanan Ashrawi, Diana Buttu, etc-- lie constantly but not usually at high profile venues like the European Parliament of the EU, like Mahmoud Abbas did last week. The lie was so big --Jews wanted to poison Arab wells (a lie out of the Middle Ages)-- so outrageous because it was groundless, in that way typical of PLO/PA lies, yet delivered before a high profile body like the European Parliament, that it drew widespread denials and condemnations. Abbas still lied to be sure in his retraction about where the lie originated, apparently within his own PLO/PA rather than in "media reports" as he claimed in his retraction. Even an Arab correspondent for the New York Times, Diaa Hadid, exposed the lie (New York Times, 24 June 2016), not to mention pro-PLO/PA bodies like JStreet and "Human Rights Watch," so Abbas was put in a position where it was more advantageous for him to retract the lie than to keep on supporting it. Following the uproar in the wake of his water blood libel to the EU parliament – which even included a NY Times report by Diaa Hadid decrying it (but not from the EU parliament itself, which applauded him after the speech) – PA President Mahmoud Abbas’ PLO has retracted it. Palestinian President Mahmoud Abbas on Saturday morning retracted accusations he made days prior about Israeli rabbis calling for the poisoning of Palestinian wells. 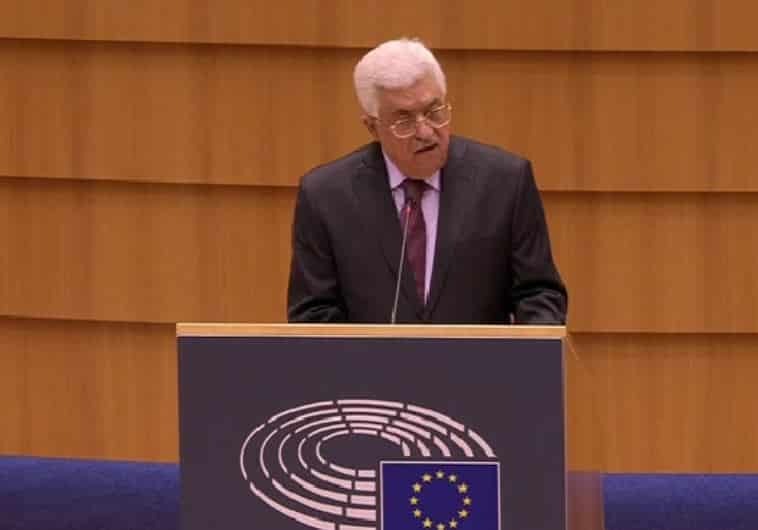 The Palestinian Liberation Organization, which Abbas chairs, issued the retraction after the PA president made the unsubstantiated charge in an address Thursday to the European Parliament. The comments prompted a harsh condemnation from Israel, with Prime Minister Benjamin Netanyahu accusing Abbas of propagating blood libel, referring to anti-Semitic allegations against Jews that arose in the Middle Ages. The PLO’s statement Saturday said that Abbas “rejected all claims that accuse him and the Palestinian people of offending the Jewish religion. “After it has become evident that thealleged statements by a rabbi on poisoning Palestinian wells, which were reported by various media outlets, are baseless, President Mahmoud Abbas has affirmed that he didn’t intend to do harm to Judaism or to offend Jewish people around the world,” the statement read. The retraction also added that Abbas condemned all accusations against him of anti-Semitism. Abbas’s remarks to the European Parliament did not appear on the official transcript issued by his office, suggesting he may have spoken off the cuff as he condemned Israeli actions against Palestinians amid stalled peace talks. “Only a week ago, a number of rabbis in Israel announced, and made a clear announcement, demanding that their government poison the water to kill the Palestinians,” Abbas said, in what appeared to be an invocation of a widely debunked media report that recalled the medieval anti-Semitic libel. Abbas, who received a standing ovation from EU lawmakers after his speech, gave no source for his information — and there has been no evidence over the past week of any call by Israeli rabbis to poison Palestinian water. But here’s the deal. Even this retraction is dishonest. As I posted last week, the blood libel seems to have originated with the PLO itself, being first published by the PLO’s National Bureau for the Defense of the Land and to Resist the Settlements on June 16th – days before it appeared in other news outlets. So when the PLO retraction blames it on “various media outlets,” they are deliberately and dishonestly hiding the fact they were the ones who started it, these media outlets merely parroting the PLO story. Not only that, but as I noted (and I believe I was the only one to notice this), Abbas did not merely parrot this blood libel from days before but he embellished it. The original blood libel mention one Rabbi – the non-existent Rabbi Shlomo Mlma – issuing an ‘advisory opinion’ in which he allowed Jewish settlers to poison water in Palestinian villages and cities. But to the EU Parliament, Abbas mentioned “a number of rabbis” who demanded “their government poison the water to kill the Palestinians.” An even harsher accusation if that’s possible. Yet the retraction mentions only the earlier blood libel about the one rabbi. In other words, this came from Abbas. His own PLO started the blood libel and he embellished on it, trying to make it sound even worse when he stood up in front of the EU Parliament. As I posted yesterday about Palestine Post-gate, Abbas knows what he is doing when he lies or is otherwise being dishonest. He knows his audience. He knows once he puts out a particularly image or soundbite, so many people will lap it all up. He knows too that many will not even remember this retraction. Abbas cannot be trusted when it comes to anything he says, including any so-called desire to reach a peaceful two-state solution. Update: Even Dia Hadid of the NY Times acknowledgesthe PLO started the blood libel. The Palestine Liberation Organization had initially published the allegation on a website run by one of its offices, and it spread through some regional news media outlets. In October, Mr. Abbas erroneously accused Israeli forces of killing a 13-year-old Palestinian boy who had taken part in the stabbing of two Israelis. The boy had actually been wounded and later recovered. Anybody who still claims that Abbas is a reliable partner for peace is either a fool or a deliberate liar. Ahead of his trip to Rome to meet with US Secretary of State John Kerry, Prime Minister Benjamin Netanyahu on Sunday slams PA President Mahmoud Abbas for spreading “abhorrent lies” against Israel. Abbas last week falsely accused Israeli rabbis of urging the poisoning of Palestinian wells. He later retracted the remarks.